How will I receive the designs I ordered? The last three letters before the .zip is the format. You only need to download the color chart and formats you need. Click the link for the format you need. Depending on your browser a window will open asking you where to save the file. (DO NOT click open if that is an option) The file might take some time to download especially the color chart zip files. Once the file is downloaded completely you must unzip the file before you do anything with it. Links for your designs are listed. Option: You can click on the Ordered files tab, then click the order number. Links to your zip files will be listed. I am having trouble downloading my designs. Could you please resend? What exactly do you mean? You can’t “download” the file? Download means you can’t download the zip file to your computer. Is that what you are having trouble with? Or do you mean you can download the zip file but you can’t unzip it? Or do you mean you can unzip it but you can’t load the file on your machine? Be advised that some singles zip files you download has other zip files inside of it. You must unzip the zip file you downloaded then unzip the format(s) you want to use and the colorchart.zip file(also contains any instructions) if there is one. Whatever stage of the above you are having trouble with write us and let us know. We will need to know the format you are having trouble with. If it is PES let us know what version of PES you need. Will depend on the version of PE Design you have. There is nothing to resend. You are emailed a link to download a zip file. Sending you another copy of this link does nothing. Don't I get instructions or color Charts?????? I get these two questions a LOT. When you receive your delivery email with links you will see one that ends in colorchart.zip. This is where all the color charts, instructions, templates and patterns are. Be sure to download it in addition to the design formats you need!!! What formats does BFC have available? First things first. DST is the most stable format to use and can be used by most embroidery machines and is the most accurate. The list of formats BFC offers will evolve as needed. Some formats may be added and others will be removed. Instructions, color charts, templates, thread conversion and other important information can be found inside the ColorChart.zip file. How can I easily find and purchase various thread colors? I know a large website can sometimes be daunting so I wanted to give some hints to shopping for our thread. If I know the numbers of the colors I want, I find the easiest way is to put the number in the search box. You just need the 4 numbers - like 2170 for Black. 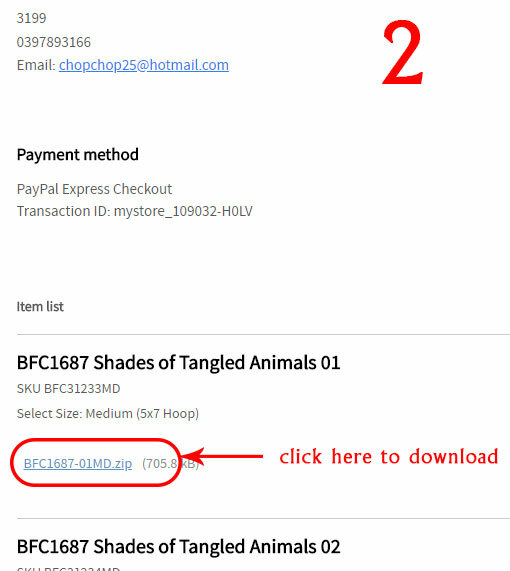 Once the color is shown on the page, you can just click the little shopping bag under the picture of the thread to add it to your cart - you don't need to open the page for the thread color. If I am looking for thread for one or more design set, I print out the Thread Chart found on the design set page. Then I can take this and use the above method to find the colors. If you just want some new colors, then I would recommend clicking on the 1000m Category under machine Embroidery Thread on the left had side of the menu. You can then choose one of the groups of colors, for example 2170-2297. Click on this category and the individual thread colors will be on the page. 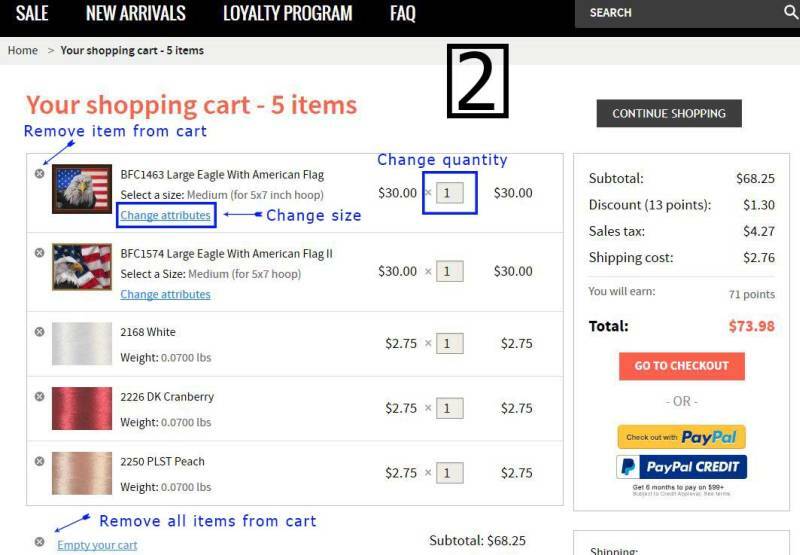 Again, you can just use the little shopping bag to add what you want to your cart. .
Do you have Conversion Charts for BFC Thread? Yes we do. Go to the Home Page, then scroll all the way down to the bottom. You will see conversion charts - click on this to see the charts we currently have available. 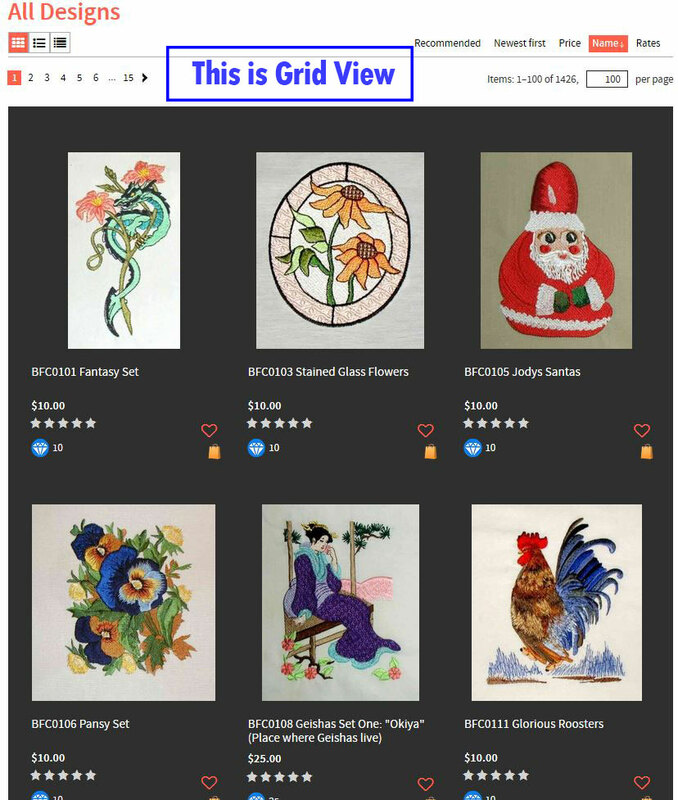 We have 2 different Newsletters: BFC New Products and Sales - This announces our new products and Designs and any new sales. We also send it out to remind you when a sale is ending the next day. You will usually receive 4 issues a week unless we have something unusual to announce. This newsletter has an exclusive free design to download at least once per month. BFC Info Newsletter - This is not an advertising newsletter, but is designed for information. 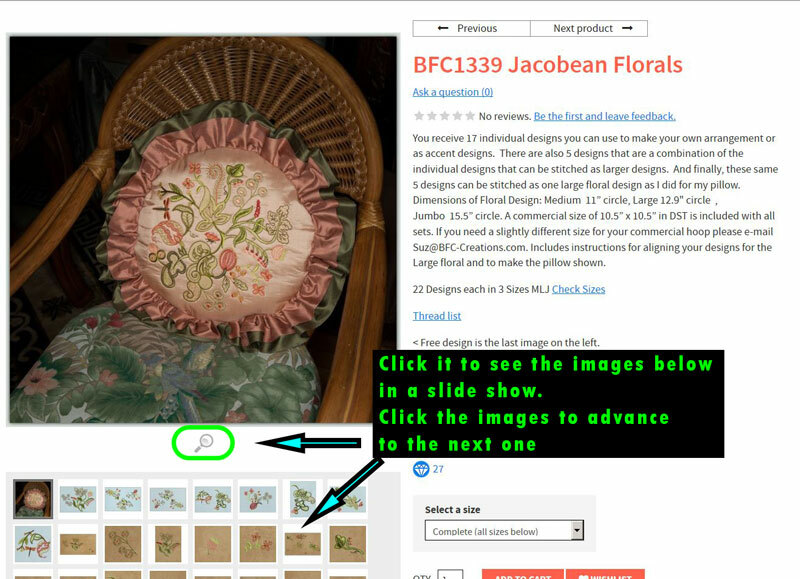 It might be hints on using the BFC site, projects to try, customer hints and ideas, products I discover - anything I think would be interesting for embroiderers! I plan this once per month, but if I have a lot of things to impart I will do an extra issue occasionally. Is it hard to align your large designs? In the Free Tutorials section you will find a tutorial on how these are aligned. It comes with two designs for you to use to practisce the technique. We have had great reviews of how easy it is! On a regular sized iPad the website displays just as it does on a regular computer or laptop, BUT when you go down to an iPad mini size or to a smart phone sized display screen, the website displays differently. The BFC Creations part of the banner is in the center rather than on the left side of the banner. Just above the BFC Creations banner is a coral banner with 5 icons positioned along the coral area. From left to right they are 3 lines stacked one on the other, a magnifying glass, a silhouette of a person, a shopping bag and a 0. That is VERY different from the display on a larger computer display. The 3 lines stacked one on the other is the menu icon. If you touch it, the website menu displays. This is the menu that displays on the left side of the page on a larger display screen. The magnifying glass is the search icon. 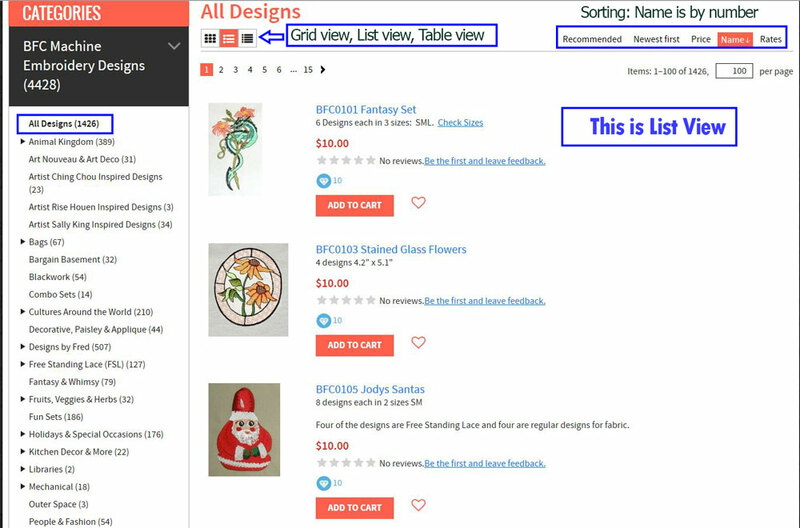 If you touch it you will get a search window to find designs by name or number quickly. The silhouette of a person is the sign in or register icon. THIS IS THE ONE to be used to sign in to the site or to register your account with the site!!! There are several ways! 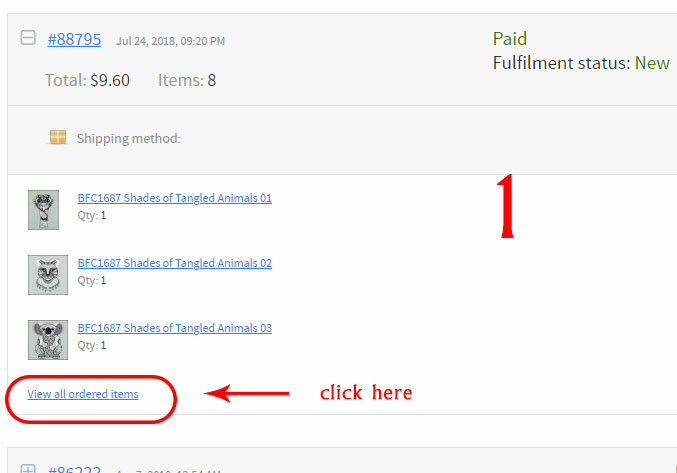 Anywhere you see the little coral colored shopping bag you can click it to put the item in your cart. Or if you are on the Product Details page you can click ADD TO CART. 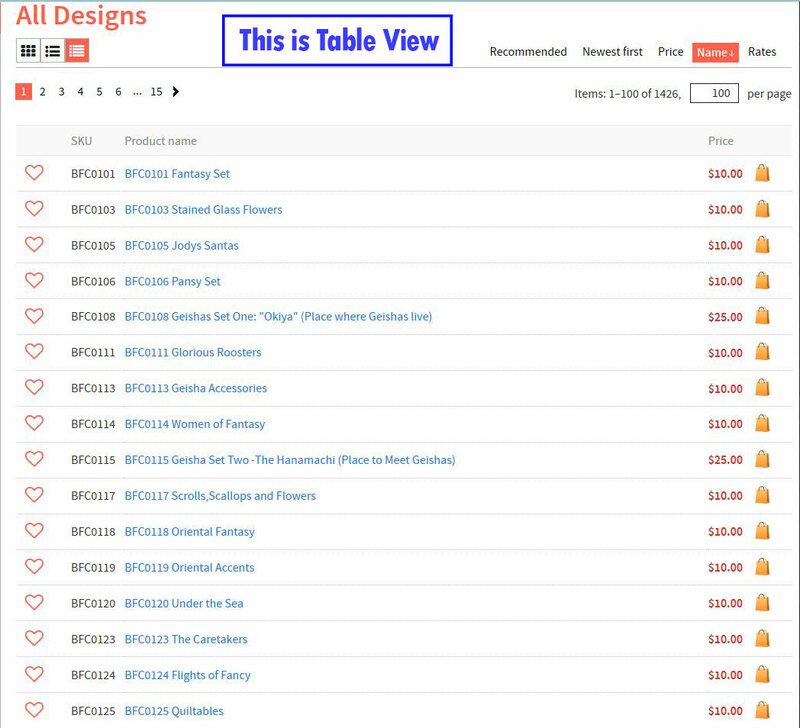 How can I see what items are in the shopping cart? The opened cart. You can do many things here to edit your order. How can I see a list of all the embroidery designs? Can I access my history to download designs? Yes - everything you purchase in our new site will be in your account by order. We have also worked with programmers to import all the links from your Design orders done in the original site. However, to access these you have to register with the same email address you used to purchase from us. If this is no longer a valid email address, you can set up two accounts - one for old order and one that you will use to purchase from now on. I have checked with the programmers and they are checking to see if there is a way I can edit the histories to add your new email address. I will announce if this is possible. What does *you must choose options* mean? Most of our designs can be purchased in one size, or all available sizes. 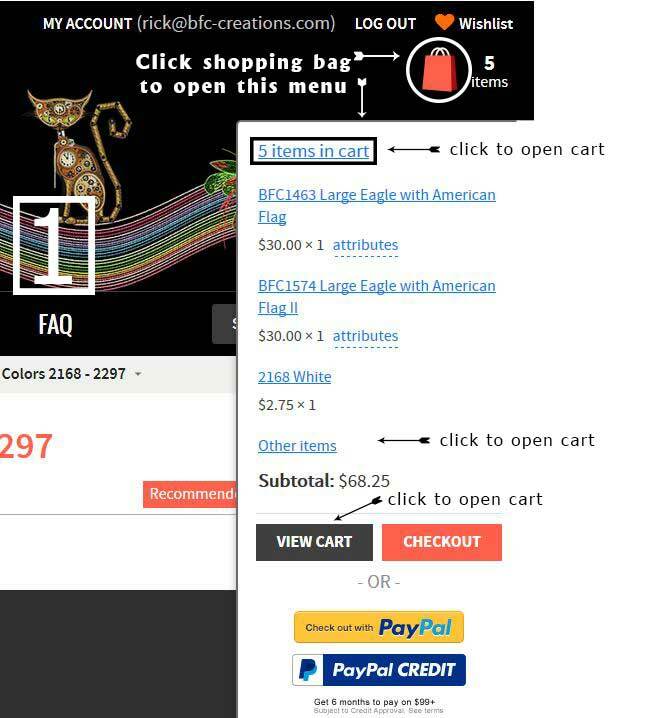 You must choose one of these options before you can put the item in your cart. This is to help prevent you from purchasing the wrong option. How do I use the Wishlist? You must register and login before you will see your Wishlist in the upper right corner of the page. Below each product you will see the outline of a red heart. You click this to add the product to your Wishlist. If you aren't logged in and click on a heart it will say at the top of the page you must login to use the Wishlist. Once you add a product to your Wishlist, the products you've added will have a solid red heart so will know if you've already saved it. To access your Wishlist click on the Wishlist at the top of any page. You can purchase directly from your wishlist by clicking on the Shopping Bag or click on the product to see more information. How can I see how many Loyalty Points I will get for a product before I purchase? Below the image of the product on the Category page you will See a Blue Diamond below the picture of a product. next to the Diamond you will see the number of Loyalty points you will earn. You will also see the Diamond and points on the Product Detail Page. How do I view large images on the product pages? Can I use your designs on items for sale? Yes - you definitely can! We have no restrictions as to how many items. We require that you reference BFC Creations (and the Artist if applicable) in your product documentation. Can I buy a Thread Kit for my designs? Under the *Related Products* at the bottom of the Product Detail page you will see if a Thread Kit is available. You can purchase it from that link. What is *NEWS* on the left side of the menu? News is where I will post Hints, New things coming...anything that will be of help or interest. How do I check the balance of my BFC Gift Card? Look on the left side of the Home Page under the header Gift Cards. Click Premium gift card. On the next page click the "CHECK GIFT CARD CODE BALANCE" on the right side of the page. (black and white button) In the box that pops up enter your gift code and click Verify Code. The next screen will show you the balance of your Gift Card in this format: Balance: $107.50 / $125.00 The first number is the current balance and second number is the original value. Click the X to close that box.